Where do real estate agents learn how to advise buyers and sellers about all the aspects in land transactions? The REALTORS® Land Institute. (RLI), “The Voice of Land”. RLI is the essential national membership organization for land real estate professionals. RLI has over 1,200 national members out of approximately 1,600,000 REALTORS® (approximately 98% sale homes) and RLI has about 500 members that have earned the elite Accredited Land Consultant (ALC) Designation. RLI Land University (LandU) provides 17 certified classes, like “Land Investment Analysis”, “Transitional Land Real Estate Transactions”, Agricultural Land Brokerage & Marketing”, “Timberland Real Estate”, “Real Estate Site Selection” and more. Meeting stringent requirements a member may obtain the coveted ALC Designation. To identify a RLI member or ALC in your market area, go to www.rliland.com and use the “Find a Land Consultant” search tool on their home page. Other than RLI there is only two related Land classes available which counts for CE credit. Each state has continuing education requirements which agents must complete to keep their real estate license active. In North Carolina we are required to take eight hours annually. Four hours are required for all agents and four hours are elective with around three hundred of those courses houses are all about houses with few exceptions. Several years ago I instigated and now teach the only land class approved for North Carolina continuing education “Introduction to Land Brokerage”. Speaking with other agents around the country it appears it is the only land related continuing education class that can count towards those hours. Since 2003 I have taught one of our REALTORS® Land Institutes two day courses “Land 101: Fundamentals of Land Brokerage” all over the country. I also wrote along with Ron Loftis MAI, REALTOR® a four hour continuing education class for the North Carolina Appraisal Board called “Rural Land Values – Art or Science”. It to my knowledge is the only land class for our appraisal industry CE requirements. 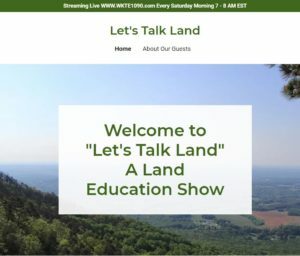 Advocating and recognizing the need for land education I now have a one hour talk show on WKTE 1090 AM in King North Carolina which airs weekly from 7 to 8 AM EST every Saturday. It can be streamed at www.WKTE1090.com. Now we have also launched a Podcast www.letstalkland.net. Here you may listen to all recorded shows by date, title and guest. The thesis of the show is to provide experts in the various field of land to provide the nuances and important aspects of their respected fields. It is a true land educational talk show. It is designed for buyers, sellers and owners of land to have one source to discover land issues. It is also designed for real estate agents and REALTORS® a source, in addition to the education provided by RLI through their LANDU Education Programs, for agents to access land education. We encourage that agents link our show to their website to help their buyers and sellers better understand land transactions and encourage national and state real estate associations to include it on their educational sections of their websites. Some of the current subjects discussed by my shows guest are surveying, soils, timber, farm management, wetland, wetland mitigation and mitigation banking, auction advantage, land financing, land attorney, land development, a definitive book on land, land development and more.